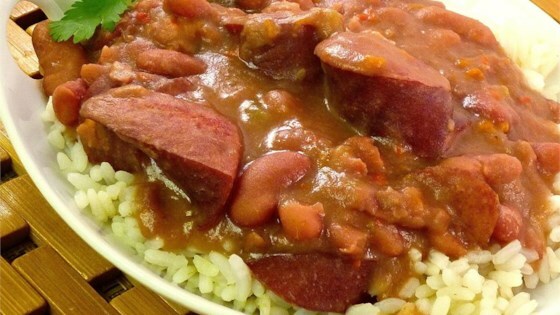 "If you want real Cajun, you have to try red beans and rice. Often, this simple dish is loaded with fat and sodium. Try this reworked recipe that everyone loves! No one will ever know it's the 'healthy' version! My daughters LOVE this!" Put red beans in a large pot with enough water to cover by several inches. Soak 8 hours to overnight. Drain and rinse beans. Pour hot water into the pot. Add beans, sausage, onions, bell pepper, celery, cayenne pepper, salt, and bay leaf to the pot; stir. Place pot over medium heat, put a cover on the pot, and cook, stirring frequently, for 30 minutes. Reduce heat to medium-low and continue cooking at a simmer until the beans are tender, about 30 minutes more. Remove and discard bay leaf before serving. If you aren't concerned with the fat content, try different sausages to vary the flavor. I recommend Tasso ham or andouille sausage for a true Cajun flavor. I followed the recipe exactly and it was so watery and very, very bland. Will not be making it ever again! The beans were not cooked enough, even after double the time suggested. The taste was good, though, with two cups of no-salt chicken broth instead of two cups of water. I did as the other reviewers said and lessened the water by 2 cups and added chick broth. It was a nice healthy meal. We enjoyed it.